In Burlington and Oakville, Milton and Halton Hills, and throughout the Halton Region, you can count on one team for expertise and customer service that's above any other. With the number of growing communities in the region, our Reliance team is specially trained to help you find a comfort protection plan that can offer you peace of mind. In fact, our builder grade heating and cooling systems in newer homes help you to avoid costly repairs and ensure your HVAC system is running at its best. No matter what you're looking for, we'll help you choose a new efficient, Energy Star-qualified system that meets your family’s needs – and your budget. From our friendly and knowledgeable call support to our fully licensed technicians and installers, we always make it our goal to help you find the right home comfort solution for your home. 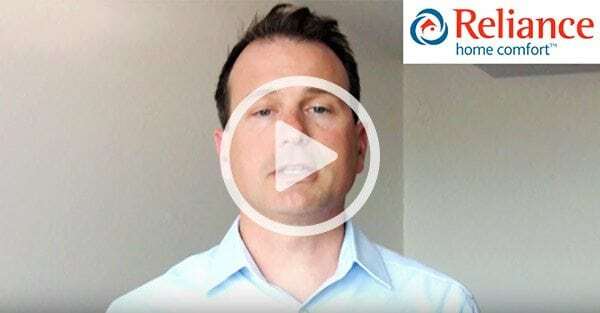 Understand how well your current heating and cooling bundle is performing. Learn about how to choose the right bundle for your family. Find out which bundles are the right size for your house. How to best customize your new system to maximize your family's comfort. At Reliance, our goal is straightforward – to be your first choice for home comfort, all year, any time. Give us a call! The Reliance Home Comfort team in Halton Region doesn’t just work here, we live here too and we’re proud to be part of your community. It’s why we’re such strong supporters of United Way and Habitat for Humanity. And why we’re a sponsor the Oakville Waterfront Music Festival and the Oakville Soccer Club. We also love to encourage kids to be active, so if you have a sports team that needs a sponsor, don’t hesitate to contact us. 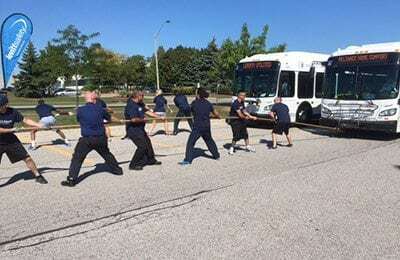 Our team members recently finished in third place in Oakville United Way Bus Pull – beat by local firefighters and the police. But make no mistake, we’ve got a rendezvous to win next time! Our team is happy to donate to United Way via payroll deductions, making small contributions that add up and make a big impact in our community – plus Reliance matches every dollar our team members donate. 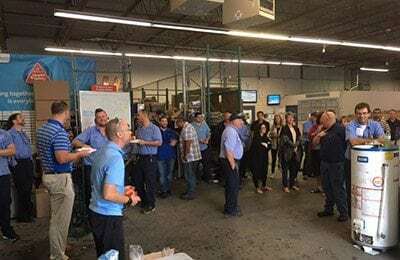 Here’s a photo from our annual BBQ in support of United Way. For the holidays, we were honoured to partner with local community organizations to make the season a little brighter for those in need. 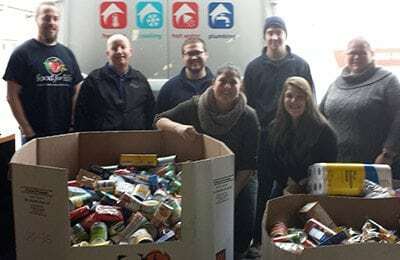 We worked with United Way and Food for Life and through the contributions and generosity of our team members, we delivered a truck-load of non-perishable food donations. "My experience with reliance home comfort is awesome. And technician/sales representative Trevor Newton is truly the best I've seen. He understands my needs for a expedited schedule and work very hard Saturday and Sunday to make an installation possible on Monday morning. He is very professional and courteous throughout and taught me a lot about HVAC system during the consultation. Five stars is underrated and I hope his company and manager appreciates his work." "I can't say enough about Bill, Wes R and Bryce J. Friendly and they got the job done effectively. Can't forget to mention that they left my home clean and tidy. I can definitely appreciate that type of impeccable service. Thank you!!! One happy customer!!" "Matt A RCH 2824 and Neil H 2729 of Reliance Home Comfort installed our new furnace and AC unit in our house and were professional, efficient, courteous/polite and punctual. These gentlemen were also very knowledgeable and neat while installing the equipment in our house. We highly recommend them!" "Adam & Melvin did an excellent job. Highly recommend Reliance. The showed up on time for the appointment and they answered all my questions and provided honest and helpful recommendations. " "In response to our call re a malfunctioning thermostat a technician came and noted that we were entitled to a new system under our rental agreement. A sales person was called and we had a new one within 5 days. The 2 technicians who did the work were very hard workers, very pleasant and thorough, and cleaned up the area completely."